demi-dos: WHAT'S UP THIS WEEKEEND? Sat. October 25th 10a.m.-3 p.m.
Join us at Malone Park for a spooky, fun-filled day! This event includes hay rides, games, food & craft vendors (Demi-Dos), pony rides, petting zoo, blessing of the animals, pet costume contest, children’s costume contest and trick-or-treating in Downtown Sikeston. We are going to be a 2 more UTAH shows this weekend and can't WAIT!!! One in Salt Lake County and one for all of our Utah County show goers! 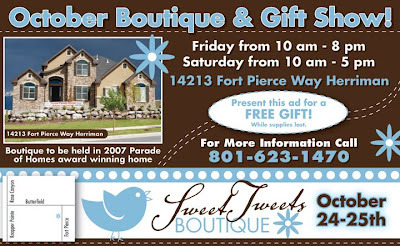 Sweet Tweets is a fun new Boutique that is taking place in a beautiful 2007 Parade of home award winning home! We got hooked up with Andra Stoker (the owner) at Oh Sweet Sadie! a few months ago and can't wait to see what she turns out. BTW if you haven't checked out OSS you can come get a taste of it here 'cause it is A-MAZ-ING! 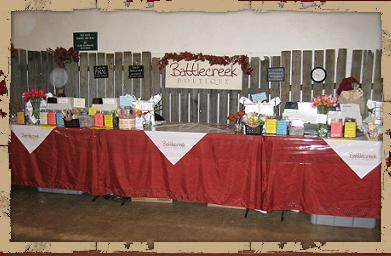 and Andra is having many of the same vendors this weekend at SWEET TWEETS! The hours are 10-8 on Fri. and 10-5 on Sat.! Feel free to email me and I'll send you a flier for a free Gift! and directions too! PLEASE STAY TUNED FOR MORE GIVE AWAYS COMING SOON!